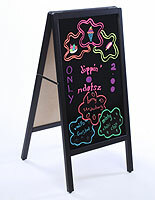 Is this style sign supply right for you? It is if you want to entice passersby to enter your store. 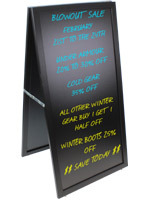 This sign supply is a store-front advertising tool. Strategically placed, it can attract customers into your establishment. 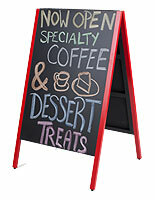 This sign supply, also known as a sidewalk sign or sandwich board, increases the foot traffic inside your store. When foot traffic is elevated within your store, sales are bound to increase as well. 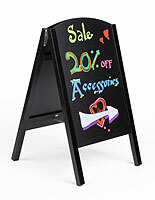 SignSupplies2Go.com, an industry leader, provides this sign supply in a variety of styles at wholesale prices. 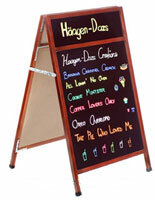 With so many options and wholesale pricing, there is certain to be sign making equipment that will work for you. 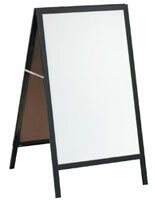 This portable sign supply may option a black or white write on surface. Either surface will present an eye-catching display that will attract attention. 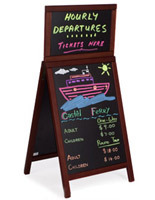 The write-on sign supply also features three distinct surfaces: dry and wet-erase, and chalkboard. 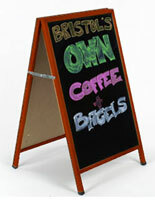 Which sign supply surface is right for you? 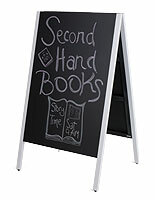 Chalkboard faces are great for those that captivate in routine sign changes and keep their signs within view. 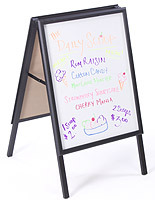 Chalk writing smudges easily so this sign should not be used in a high traffic area without supervision. 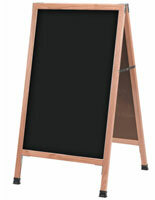 However, chalkboards clean easily so making message changes is fast. 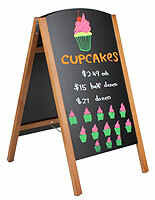 Chalk is fairly inexpensive, as well, so buying supplies won't break your bank. 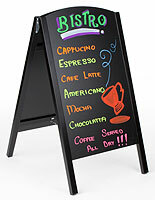 Chalkboard signs are featured in our dark surface signage category. 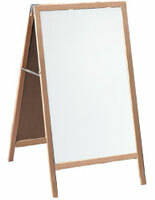 They are often used in restaurants and retail outlets, but are even great for classrooms. 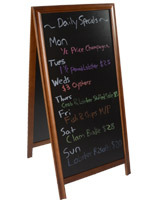 Dry-erase surfaces provide messages that are more longstanding than chalk messages. 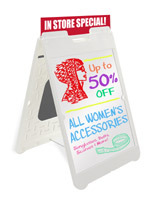 The dry-erase markers will smudge if fingers are run along the surface. All it takes to change a message is the proper eraser. 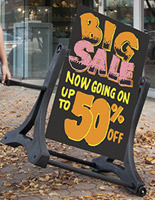 Again, these models are great for temporary advertising and may be used in high traffic areas, but they accidental smudging by passersby is possible. These markers are relatively inexpensive and will last for quite some time. 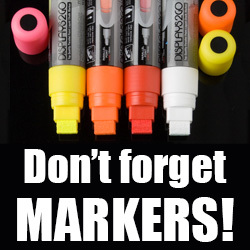 Of course, not all dry erase markers are the same and it is important to buy the best on the market. Check out our marker sets for units that we have tested to be able to attest to their quality. 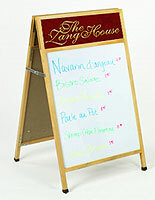 Wet-erase surfaces provide for the most longstanding message. Still easy to change, this writing does not easily smudge. In fact, a wet erase surface requires a damp cloth for message removal. 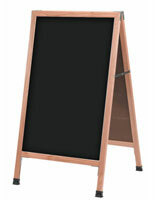 That makes these boards a great choice for high traffic areas with little supervision. 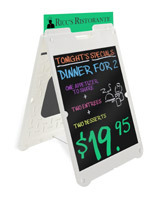 Again, the marker sets are fairly inexpensive and they come in a variety of colors, which allows for more creative use of the display. 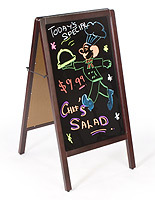 Why choose a write on sign supply in the first place? 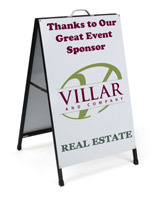 Many businesses as well as public and non-profit organizations need to create temporary signage on and off through the year. 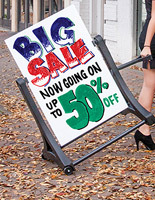 A write on sidewalk sign allows a shop to do this without having to pay for expensive printed graphics over and over again. 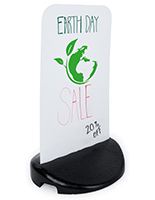 The temporary nature of this signage as well as the low cost of supplies, allows for messages to be changed over and over again – even several times in a single day! 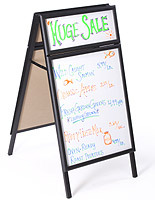 Easy changes, low cost to maintain, no need to hire a sign maker – why wouldn't a commercial or non-profit organizatoion want to use this sign making equipment? 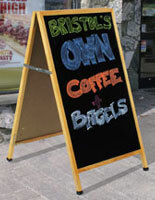 Wholesale sidewalk signs are the perfect choice for every company that wants to attract both pedestrians and motorists. 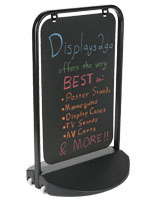 The easy to use signs hold poster inserts, individual letters, and have white board surfaces, like the ones highlighted in this category. 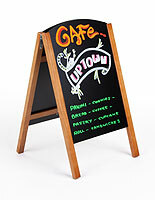 They are highly effective at attracting attention to sales events, special happenings, and menu choices. 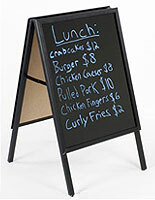 The ability to routinely customize a sign makes them the cost effective choice for many businesses. No need for expensive posters for every event. 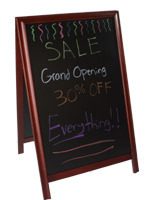 Just artfully create your message and you have a custom sign at a very low cost! 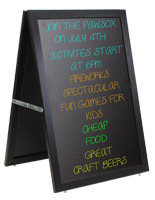 At SignSupplies2Go.com, we continuously seek out new sign making equipment that enhances the advertising capabilities of our customers. As we carry over 500 wholesale products, our company catalog is separated into categories. This makes it easier to find what you are looking for. 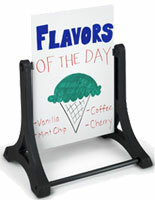 Included in our catalog are a variety of sign standoffs and metal screw caps. 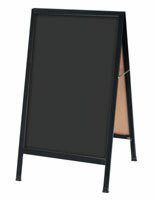 This sign making equipment elevates the look of standard wall signs by covering the screws. 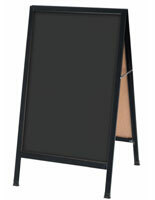 Used in most professional settings, this office sign equipment is great for retail and restaurant environments, too. They are that little added touch that gives an air of sophistication to every environment. 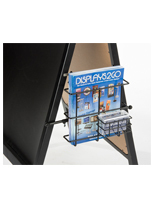 Our catalog features cable displays as well. Cable display systems allow you to take advantage of that open air space above a showroom. These hanging signs are suspended on a wall or used to hang posters from the ceiling. 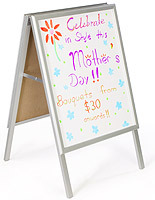 They can be placed artfully throughout a showroom to promote sales events, new arrivals, or just to send out greetings. 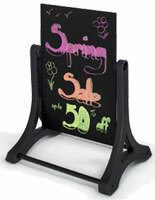 They can also be placed strategically to draw attention to specific displays such as new arrivals or clearance racks. Our wholesale catalog also includes window and door signs that are used for a variety of reasons including identifying room use or occupants. The units with suction cups attach to such places as window glass. 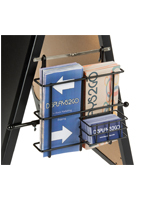 Poster hangers and fast clip frames hold large and small graphics and are hung on the wall, ceiling, or suction cupped to windows. 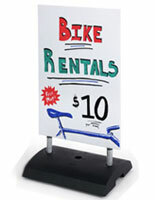 A-frame signs for both indoor and outdoor usage or also included in our catalog. 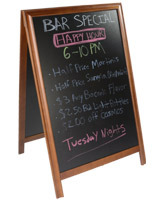 These signs, including this category of write-on signs and those with fillable bases, are ideal for any company that experienced high levels of foot traffic. 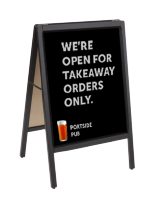 Flag and banner stands, sign frames, are specifically designed to attract attention of those that pass by as are our illuminated signs. 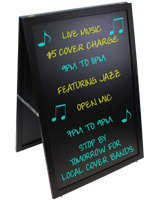 Exterior poster displays are perfect for every company that wants to highlight products to pedestrians. These units are often seen in front of restaurants, libraries, community centers, churches, schools, and other public buildings. Browse through our company catalog now to see our entire selection!